2014 champions Györ are the first obstacle that stand in the way of a potential title defence for Buducnost, the 2015 winners of the Women's EHF FINAL4. The other semi-final pairing that was determined on the occasion of the draw for the 2016 Women's EHF FINAL4 on Friday in Budapest sees two-time bronze medallists Vardar playing against newcomers CSM Bucuresti. CSM Bucuresti's Nicolae Luca said: “It is a dream draw for our fans to play against Vardar. We started confident at the beginning of the season and a lot of injuries made it hard for us during the season. But now we reached our goal by reaching the FINAL4. Of course, now we want to win." The third edition of the Women's EHF FINAL4 takes place on 7/8 May 2016 in the Papp László Sportaréna in Hungary's capital, Budapest. The semi-finals on Saturday will take place at 15:15 hrs (Buducnost vs Györ) and 17:45 hrs (Bucuresti vs Vardar) respectively as well as the match for third place and the final on Sunday. Buducnost and HC Vardar return to the showpiece event of the Women's EHF Champions League for the third time and have thus participated at all FINAL4 editions to date, Györi Audi ETO KC return to the event after a one-year absence and CSM Bucuresti are the only newcomers. Watch the full draw and catch the reactions of players from each of the participating clubs from 1:06:00 onwards here. The 2016 Women's EHF FINAL4 takes place in front of more than 10,000 spectators. 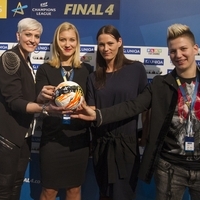 With the four participants confirmed, the demand has steadily increased over the past few days, but tickets are still available and can be purchased via the official website, www.ehfFINAL4.com.